The revamped Red Flag limousines are for government officials with the rank of minister or higher. 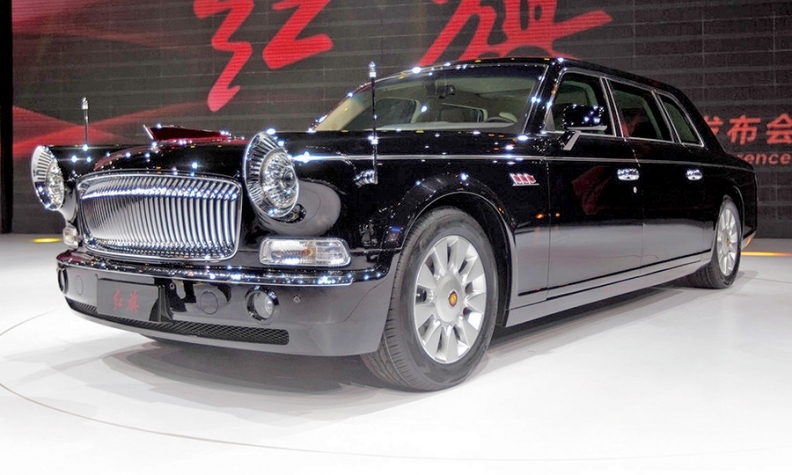 China's top communist bureaucrats have been chauffeured in foreign-badged limousines since the bug-eyed, chromed-grilled Red Flag was purged from the government fleet in the 1980s. Audis, BMWs, Buicks and other prestige brands have been the vehicles of choice for official VIPs. But that's changing, thanks in part to China's growing expertise in automaking. First Auto Works recently rolled out two new V-12-powered versions of the Red Flag, the L7 and the L9. The 20-foot-long L7 is used for government officials with the rank of minister or above and for foreign dignitaries. The L9, for China's upper echelon, adds 15 inches in length, suicide doors and an armored chassis. Cost: $800,000. The Red Flag, with its huge retro front grille, has returned as part of a push to revive respect for the Communist Party and its revolutionary heritage, Anthony Saich, a China expert at Harvard University, told The Huffington Post.